It supports the health and function of the nervous system. It promotes healthful sleeping patterns. It aids in maintaining the health of the blood and the heart. GuangZhou ZhongYi Pharmaceutical Co. Ltd.
Herbal specialists in the Guandong province have performed thorough investigations and scientific analyses on this formula. They are carefully prepared herbs and were developed into capsule form. 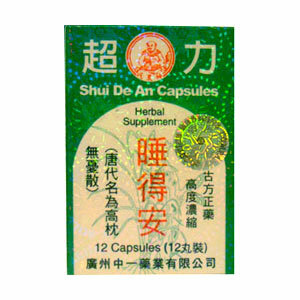 This product is developed from specific Chinese herbs, processed for use in maintaining the health of the nervous system. In clinical test, the product has proven to be highly effective in promoting healthful sleep. Favorable results mat be seen in about a week, but in some cases, results may be seen in as little as 1-2 days, or as long as 2-3 weeks. This product is effective for a long time. It can be withdrawn after a short periods of use and still maintain its effect in supporting healthful sleeping patterns. Take 1-2 capsules with cool boiled water, just before bedtime.